Director Mike Newell [Great Expectations (2012); Donnie Brasco (1997); Four Weddings and a Funeral (1994)] adapts Mary Ann Shaffer and Annie Barrow’s best-selling novel, with Lily James and other Downton Abbey cast starring in this good looking, undemanding but engrossing romance and mystery tale. In 1946, Juliet Ashton, a London-based writer with a recently published bestseller, is looking for new inspiration for her next book. 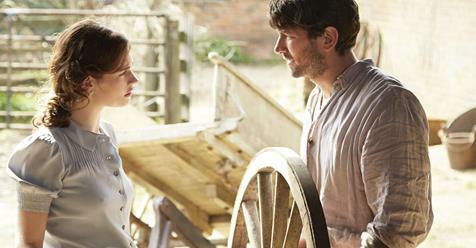 She is intrigued by the curiously named society, and its member, pig-farmer Tom (Michiel Huisman – Game of Thrones; The Age of Adeline) with whom she has been exchanging letters. She feels compelled to leave her agent Sidney (Matthew Goode) and new fiancé Mark (Glen Powell) and visit the island to get a picture of what life was like during the Nazi occupation. Fascinated by the stories of their lives during the Second World War and by a central mystery, she strikes up what will ultimately become a life-changing bond with the island’s eccentric inhabitants. A strong ensemble cast, also including Jessica Brown Findlay, Katherine Parkinson, Tom Courtenay and Penelope Wilton, is ably supported by beautiful, atmospheric cinematography from Zac Nicholson. With immaculate period detail, and despite its mouthful of a title, The Guernsey Literary and Potato Peel Pie Society is a comforting and cosy drama.